Here you can select at leisure from a number of different categories and a shopping cart is provided to make ordering easy. 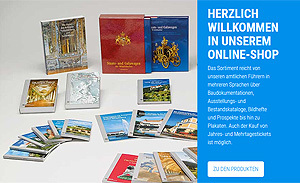 The varied assortment includes our popular official guides in several languages, building documentation, exhibition and inventory catalogues, picture books and prospectuses as well as CD-ROMs and posters. Here you can also buy our annual season tickets or 14-days-tickets. the company KulturGut AG offers numerous other articles such as high-quality bags and textiles, jewellery in historical styles, silk scarves, CDs and the "MiniKini" assortment for children. 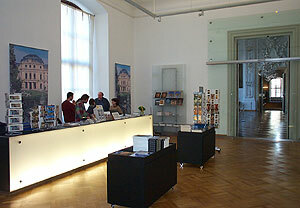 A selection from this range of products can be found in the online museum shop of the KulturGut AG: www.kulturgut.de.